Shimano’s SPD pedals are some of the best road bike pedals on the market. The company revolutionized the cleat system, and their pedals offer a lower entry price than the competition, such as the Look pedal design. The quality that Shimano offers is unmatched at this price point, and the company’s pedals are getting lighter thanks to the carbon fiber design. SPD’s are the best entry-level pedal, and a lot of experienced riders are turning to these pedals, too. We’ve had the unique opportunity to research a few of the top models on the market, and we’ve reviewed each below. One-side vs Platform: Platform pedals don’t offer a cleat design, which is a disadvantage for longer rides. Riders benefit from one-side / platform designs, as seen with the A530, because cleats or regular shoes can be used when riding. This allows for a one-size-fits-all setup packed into one pedal. Cleats: The cleat design provided for SPD pedals is a two-bolt design. Cleats are almost always included with a pair of pedals, and this is a nice extra. You may need different footwear if you have a non-two-bolt shoe. SPD Vs Look: SPD pedals are considered mountain bike pedals because of their design. The great thing about the SPD design is that it enables riders that need to walk more often to do so. Look pedals are high-end pedals that are very expensive. Shimano PD-R550 SPD-SL Road Pedals – The Shimano PD-R550 offers a lightweight resin body with an easy entry design. These road pedals offer the company’s 3-degree float cleat set for enhanced comfort when riding. Stainless steel plates offer durability with flex reduction. Cyclists who want to move to clipless will prefer these pedals. Trouble-free cleat engagement and the resin body allow for protection against abrasion. Tension adjustments allow for accurate tightening of the PD-R550’s. Perfect for road performance, this is a pedal that riders of all levels will appreciate. Note: these pedals come with cleats and hardware. The weight of these pedals is a combined 310g. These are a low cost, high-end pedal set. Shimano A530 SPD Pedals – Shimano’s A530 pedals are a one-size pedal that offer one of the lightest weights in the Shimano lineup. One-side SPD cleats allow riders to clip into the pedal for longer rides. Platform sides allow riders to use regular shoes for on and off rides. These pedals weigh just 383g as a pair. Entry, release and float are adjustable with the A530s. Riders that want versatility will enjoy the cleat and platform option. A set of cleats is included with these pedals to offer a longer ride when needed on trails. Sealed-cartridge bearings offer a long-lasting design. 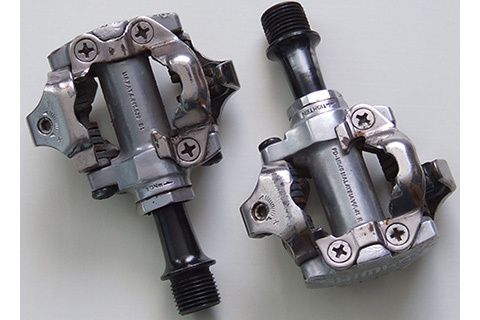 Mountain bike shoes with the 2-bolt system can be used with these pedals. Shimano 105-5800 Road Pedal – The 105-5800 by Shimano offers a carbon composite design for a light weight that doesn’t compromise on durability. An extra-wide platform allows for maximum power transfer to the pedal for an easier, more efficient ride. Wide bearing placement provides stability and optimal power transfer. A stainless steel body plate allows the pedal to reduce flex and protect against pedal body wear. Tension settings are available, with entry and release adjustability options. These pedals weigh just 285g – 35g less than most models. A 3-degree float cleat set is provided. The pedals hang vertically when released. When performance is what matters most, it doesn’t get much lighter than these 285g pedals. Shimano PD-A600 SPD Road Bike Pedals with SH-51 Cleats – The A600 provides true performance thanks to the proven SPD bindings. The low-maintenance, sealed cartridge design allows for an affordable, long-lasting pedal. The recessed SPD design allows for easy walk-around when needed. An extra-wide platform allows for efficient energy transfer to the pedals. The recessed SPD is great for mountain biking, and the stiffness and weight make this a nice road pedal, too. Riders who don’t want to stay on their bike the entire time will find these pedals a good fit. These pedals are one-sided. A two-way release is offered, and the cleat fits the two-bolt configuration. These pedals can double as a touring pedal, too. Shimano Ultegra PD-6800 SPD-SL Pedals – The Ultegra 6800s are a standard in the road pedal industry. 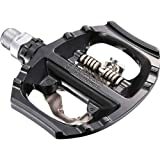 These pedals are one of the most recognized in the world, and they offer a carbon fiber pedal body with an aluminum cleat plate to keep them lightweight and durable. A +/- 3 degree float allow the pedals to fit the rider better. The pair weighs 353g with cleats and just 283g without the cleats attached. Entry and release are adjustable, and an 8mm wrench is used to attach these pedals. The cleat design is snug to keep the feet in place. A set of cleats are provided, which are easy to clip in and out of once broken in. The right SPD pedals will allow you to excel in a race, or if you’re mountain biking. These pedals differ from the competition in price and quality. A unique cleat design allows for easy entry and release, which is great for users who mountain bike. If you need to walk around when riding, these are great pedals. Hot spots are a rarity thanks to the design of the cleats, so riders’ feet are comfortable the entire time. Even on 100-mile treks, a lot of riders state that hot spots are non-existent with the right pair of shoes. Weight: The weight of pedals makes a big difference in your overall performance. Pedal weight is important when speed is a big factor in the rider’s habits. A triathlon rider may choose a lighter pedal because it allows for a slightly faster ride. Price: Pedals can be very expensive, and SPD pedals are no exception. While the SPD pedals are designed to be more affordable, you’ll want to make a budget to have a better understanding of how much money you can afford to spend on your new pedals. Sizing: The size of a pedal is pretty standard, but you’ll want to pay attention to the width. A wider pedal will allow for more efficiency and power transfer when pedaling. The proper size pedal will add to the user’s speed when riding, which equates to a higher overall performance when riding. If you keep these tips and the ones above in mind when buying your SPD pedals, you’ll have an easier time choosing the right road pedals for you.